The premise of the book is very cool. It’s a true mix of computational linguistics and personality psychology, in which the focus is on function words instead of seemingly more interesting content words. The author, James Pennebaker, believes that words are “a window into the inner workings of people, a fascinating and revealing way to think about language and its links to the world around us all” (17). Pennebaker analyzes different types of texts, and discovers trends in function word use, then applies the trends to new texts. For example, he analyzed men’s versus women’s writing and found a number of differences in the function word use by the two groups. People’s tendencies to use words like I vs. we, Pennebaker claims, can shed light not only on their gender, but also their age, mental state, and geographic location (as well as many other things). I really liked the section where he talks about Broca’s and Wernicke’s areas. Patients with lesions on Broca’s area often have trouble stringing together words to make sentences, while those with Wernicke’s impairments often string together many words with little meaning. 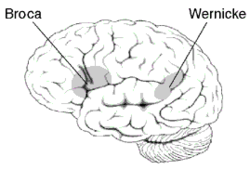 When Broca’s area is damaged, use of function words is impaired; when Wernicke’s area is damaged, use of content words tends to suffer. Although he admits that this is a gross oversimplification, the suggestion that the distinction between content and style words occurs at a pretty basic level in the brain is compelling. The chapter on using function words to detect emotion was one of the ones that I felt like his argument was stretched a little thinly. One section, called “Arrogance, loss, and depression: The case of Mayor Giuliani and King Lear” talked about a project in which Mayor Giuliani’s speeches were analyzed. In 2000, Giuliani was diagnosed with prostate cancer, withdrew from the senate race, separated from his wife on TV before telling her, and subsequently acknowledged a “special friendship” with his future wife, Judith Nathan all within two weeks. Compared to his speeches made early in his career, after these events he had a dramatic increase in his use of I-words, a drop in big words, and an increase in his use of both positive and negative emotion words. Pennebaker noticed that this was “eerily familiar” to Shakespeare’s King Lear, in which the king starts as an arrogant ruler, but is transformed after experiencing many traumas. Sure enough, analyzing the differences between a monologue King Lear made in Act 1, Scene 1 and one that he made in Act 5, Scene 3, Pennebaker uncovered the same function word trends that were present over the course of Giuliani’s speeches. It’s interesting, for sure, but seems to me that it could certainly be a convenient example. Plus, King Lear is a fictional character! From author identification that can help in catching criminals or in identifying historical authors, to understanding the thinking of presidents or tyrants, to predicting how people might behave in the future, function words are clues about the human psyche. 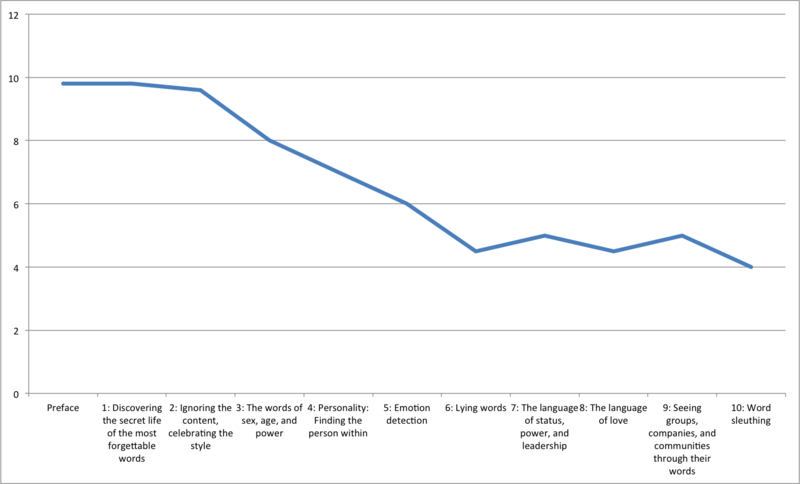 Most promising, however, is that by looking at our own function words, we can begin to understand ourselves better. I guess I would classify the book as pop linguistics- a very cool and enticing premise, even if it may be taken a little far. Regardless, it’s definitely caused me to take a second look at things I’ve said and written, wondering what aspects of myself might be revealed by words that seem, on the surface, so trivial.